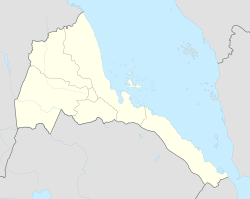 Massawa (Tigrinya: ምጽዋዕ; Arabic: مصوع‎) is a city on the Red Sea coast of Eritrea located at the northern end of the Gulf of Zula beside the Dahlak Archipelago. As a historical and important port for many centuries, it was ruled by a succession of polities, including the Axumite Empire, Medri Bahri Kingdom, the Umayyad Caliphate, various Beja sultanates, the Ottoman Empire, the Khedivate of Egypt, Italy, Britain, and Ethiopia, until Eritrea's independence in 1991. Massawa was the capital of the Italian Colony of Eritrea until it was moved to Asmara in 1897. Massawa was originally a small seaside village, lying in lands coextensive with the Kingdom of Axum in antiquity and overshadowed by the nearby port of Adulis about 50 kilometres (31 mi) to the south. The city reportedly has the oldest mosque in Africa, that is the Mosque of the Companions (Arabic: م‎, translit. Masjid aṣ-Ṣaḥābah). It was reportedly built by companions of Muhammad who escaped persecution by Meccans. Following the fall of Axum in the 8th century, the area around Massawa and the town itself became occupied by the Umayyad Caliphate from 702 to 750 CE. The Beja people would also come to rule within Massawa during the Beja Kingdom of Eritrea from the year 740 to the 14th century. Massawa was sited between the sultanates of Qata, Baqulin, and Dahlak. Midri-Bahri, an Eritrean kingdom (14th–19th centuries), gained leverage at various times and ruled over Massawa. The port city would also come under the supreme control of the Balaw people (people of Arab descent), during the Balaw Kingdom of Eritrea (12th–15th centuries). At this time, the Sheikh Hanafi Mosque, one of the country's oldest mosque, was built on Massawa Island, along with several other works of early Islamic architecture both in and around Massawa (including the Dahlak Archipelago and the Zula peninsula). The port was a major site for the Arab slave trade and Venetian merchants were said to have lived in Massawa and nearby Suakin in the 15th century. Massawa became prominent when it was captured by the Ottoman Empire in 1557. The Ottomans made it the capital of Habesh Eyalet. Under Özdemir Pasha, Ottoman troops then attempted to conquer the rest of Eritrea. Due to resistance as well as sudden and unexpected demands for more troops in the Mediterranean and on the border with Persia, the Ottoman authorities placed the city and its immediate hinterlands under the control of one of the aristocrats of the Bellou people, whom they appointed "Naib of Massawa" and made answerable to the Ottoman governor at Suakin. The Ottomans nevertheless built the old town of Massawa on Massawa Island into a prominent port on the Red Sea in typical Islamic Ottoman architecture using dry corals for walls, roof and foundation as well as imported wood for beams, window shutters and balconies. These buildings and the old town of Massawa remain to this day, having withstood both earthquakes and wars with aerial bombardment. In 1846, Massawa, and later much of the Northeast African coast of the Red Sea, came under the rule of the Khedive of Egypt with Ottoman consent. Following Egypt's defeat at the Battle of Gura, Egyptian control of the port withered. With the help of the British, the city eventually came under Italian control and became part of Italy's colony of Eritrea in 1885. Italian colonists started to settle in the port area in the early 1890s. At the end of the 19th century, the Kingdom of Italy created a modern port in Massawa for their newly acquired colony of Eritrea. From 1885–1897, Massawa (in the Italian spelling: 'Massaua') served as the capital of the region, before Governor Ferdinando Martini moved his administration to Asmara. Ras Alula's attack on nearby Dogali helped precipitate the First Italo-Ethiopian War; the Italians' disastrous defeat at Adwa ended their hopes of expanding further into the Ethiopian highlands for a decade and brought Menelik II's newly formed Ethiopian Empire international recognition. The Italian colony suffered repeated earthquakes. Most of the city was completely destroyed by the 1921 earthquake: it took until 1928 to fully restore the port, hampering initially the Italian colonial ambitions. Massawa became the largest and safest port on the east coast of Africa, and the largest deep-water port on the Red Sea. Between 1887 and 1932, they expanded the Eritrean Railway, connecting Massawa with Asmara and then Bishia near the Sudan border, and completed the Asmara-Massawa Cableway. At 75 kilometres (47 mi) long, it was the longest ropeway conveyor in the world at the time. In 1938, Massawa had 15,000 inhabitants, of which almost 2,000 were Italians: the city was improved with an architectural plan similar to the one in Asmara, with a commercial and industrial area. During World War II Massawa was the homeport for the Red Sea Flotilla of the Italian Royal Navy. When the city fell during the East African Campaign, a large number of Italian and German ships were sunk in an attempt to block use of Massawa's harbor. From 15 April 1942, later master diver and salvage specialist RNR Lieutenant Peter Keeble (then a complete rookie in both disciplines) was assigned to the clearing of the harbour. He succeeded only in the simple task of salvaging an ex-Italian tugboat. The same month, United States Navy Commander Edward Ellsberg and his handful of crew arrived to take over. The wrecks were salvaged in short order and the port was returned to service, as part of what had now become the British protectorate of Eritrea. In 1945, following the end of World War II, the port of Massawa suffered damage as the occupying British either dismantled or destroyed much of the facilities. These actions were protested by Sylvia Pankhurst in her book Eritrea on the Eve. From 1952 to 1990, when Eritrea entered into a federation with Ethiopia, previously landlocked Ethiopia briefly enjoyed the use of Massawa as the headquarters of the now defunct Ethiopian Navy. Ultimately, Ethiopia dismantled the federation and forcibly annexed and occupied Eritrea. This led to the Eritrean War of Independence (1961–1991). In February 1990, units of the Eritrean People's Liberation Front captured Massawa in a surprise attack from both land and sea. Known as Operation Fenkil, the attack utilized both infiltrated commandos and speed boats. The success of this attack cut the major supply line to the Second Ethiopian Army in Asmara, which then had to be supplied by air. In response, the then leader of Ethiopia Mengistu Haile Mariam ordered Massawa bombed from the air, resulting in considerable damage. As of 2005[update], the Eritrean government is rebuilding and repairing this damage. With Eritrea's de facto independence (complete military liberation) in 1991, Ethiopia reverted to being landlocked and its Navy was dismantled (partially taken over by the nascent national navy of Eritrea). During the Eritrean-Ethiopian War the port was inactive, primarily due to the closing of the Eritrean-Ethiopian border which cut off Massawa from its traditional hinterlands. A large grain vessel donated by the United States, containing 15,000 tonnes of relief food, which docked at the port late in 2001, was the first significant shipment handled by the port since the war began. Massawa is home to a naval base and large dhow docks. It also has a station on the railway line to Asmara. Ferries sail to the Dahlak Islands and the nearby Sheikh Saeed Island, aka Green Island. In addition, the city's air transportation needs are served by the Massawa International Airport. Notable buildings in the city include the shrine of Sahaba, as well as the 15th century Sheikh Hanafi Mosque and various houses of coral. Many Ottoman buildings survive, such as the local bazaar. Later buildings include the Imperial Palace, built in 1872 to 1874 for Werner Munzinger; St. Mary's Cathedral; and the 1920s Banco d'Italia. The Eritrean War of Independence is commemorated in a memorial of three tanks in the middle of Massawa. Massawa has a hot desert climate (Köppen climate classification BWh). The city receives a very low average annual rainfall amount totalling around 185 millimetres or 7.28 inches and consistently experiences soaringly high temperatures during both day and night. The annual mean average temperature approaches 30 °C or 86 °F, which is one of the highest found in the world. Massawa is noted for its very high summer humidity despite being a desert city. This combination of the desert heat and high humidity makes the apparent temperatures seem even more extreme. The sky is usually clear and bright throughout the year. Wikimedia Commons has media related to Massawa. Wikivoyage has a travel guide for Massawa. Miran, Jonathan. (2009). Red Sea Citizens: Cosmopolitan Society and Cultural Change in Massawa (Bloomington: Indiana University Press). ^ "World Gazetteer – Eritrea". Archived from the original on 12 April 2013. Retrieved 2013-02-08. ^ Matt Phillips, Jean-Bernard Carillet, Lonely Planet Ethiopia and Eritrea, (Lonely Planet: 2006), p.340. ^ Bjunior (8 July 2018). "Dadfeatured: ITALIAN MASSAUA". ^ Reid, Richard J. (12 January 2012). "The Islamic Frontier in Eastern Africa". A History of Modern Africa: 1800 to the Present. John Wiley and Sons. p. 106. ISBN 0470658983. Retrieved 15 March 2015. ^ Richard Pankhurst, The Ethiopian borderlands (Lawrenceville: Red Sea Press, 1997), p. 270. ^ Keeble, Peter (1957). Ordeal by water. Longmans, Green & co. No ISBN number available. ^ Also detailed in the chapter "The Feminist Fuzzy-Wuzzy" of Michela Wong's I didn't do it for you: how the world betrayed a small African nation (New York: Harper-Perennial, 2005), pp. 116–150. ^ Gebremedhin, Naigzy; Denison, Edward; Ren, Guang Yu (2005). Massawa: A Guide to the Built Environment. Asmara: Francescana Printing Press. ^ "Massawa Climate Normals 1961–1990". National Oceanic and Atmospheric Administration. Retrieved June 24, 2015.